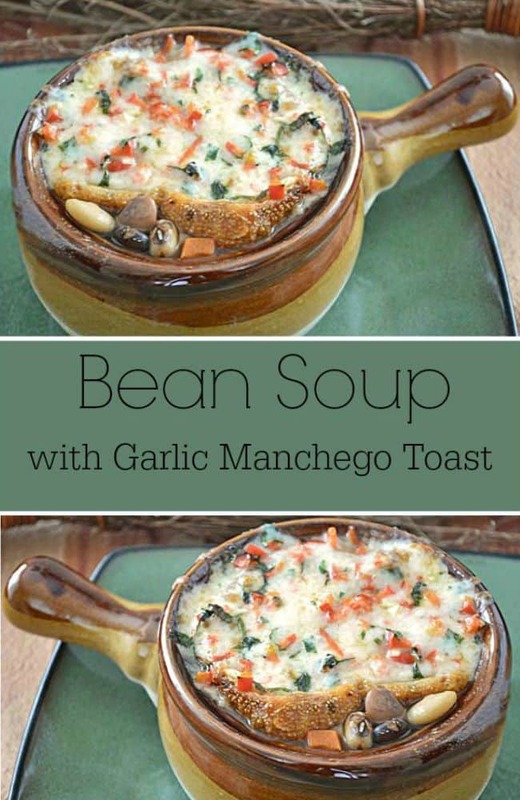 Slow cooked with 13 types of beans and topped with a slice of garlic Manchego cheese toast, this bean soup recipe makes a filling bowl of fiber and comfort. 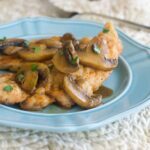 I partnered with Bobs Red Mill to create this recipe, but all thoughts and opinions are my own. Beans! They’re hearty. They’re meaty. They make my tummy happy. When Bob’s Red Mill asked me to come up with a bean recipe for their October Soup Mix Celebration, I was beyond excited to get cooking. 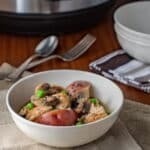 The bean soup recipe I’ve developed is wholesome enough for a weeknight but special enough to share with friends (except you won’t really want to share it. Oh no you won’t! You’ll want to eat every last mouthful yourself.). 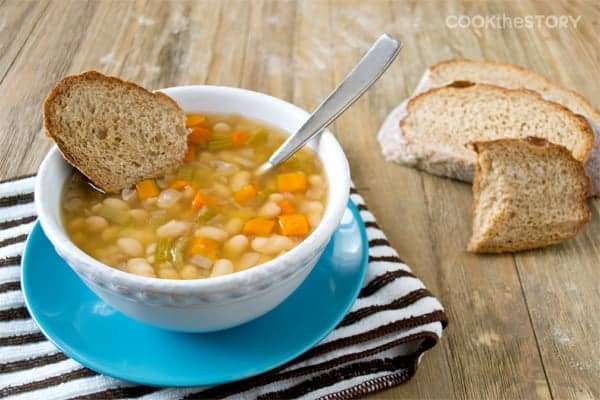 What makes this bean soup wholesome? The Bob’s Red Mill 13 Bean Soup Mix. What makes it special? The saffron and chorizo in the soup and, more importantly, the Garlicky Manchego Toast broiled over the soup before serving. You know you want some. More than some. You want a lot. You want it all. You want it now. Right now. 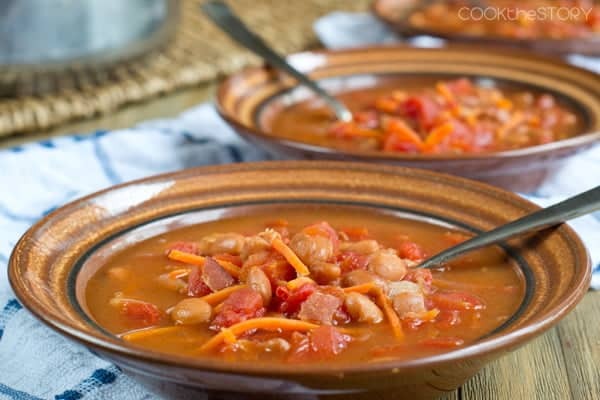 Oh, and for a 15-minute quick bean soup recipe, be sure to also check out my bean and bacon soup. 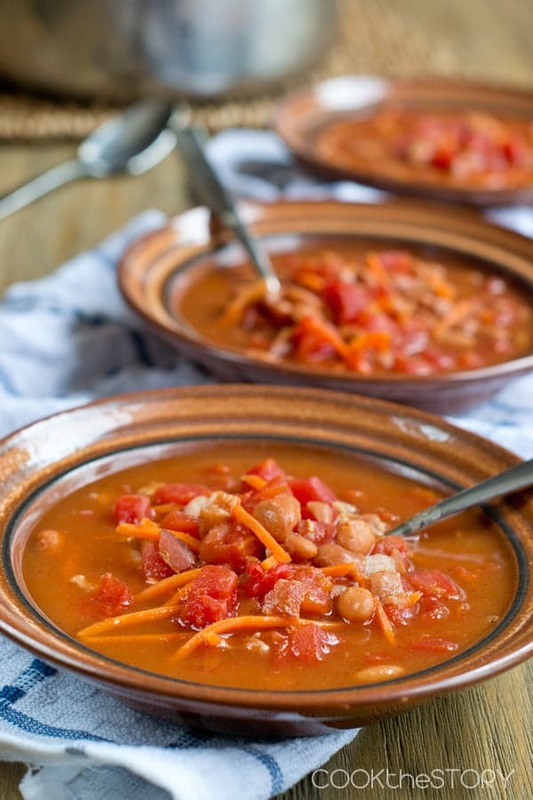 Do you have a favorite bean soup recipe? 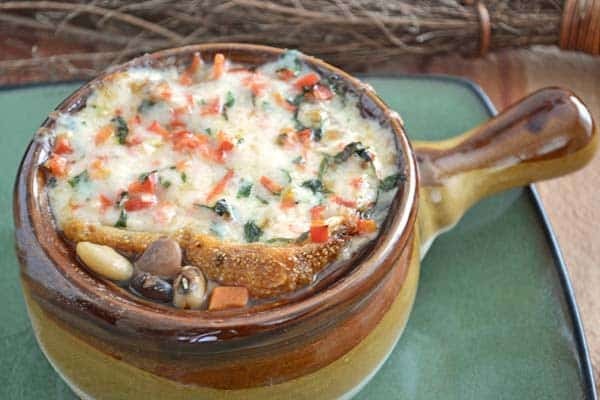 Slow cooked with 13 different types of beans and topped with a slice of garlic manchego cheese toast, this bean soup is a filling bowl of fiber and comfort. 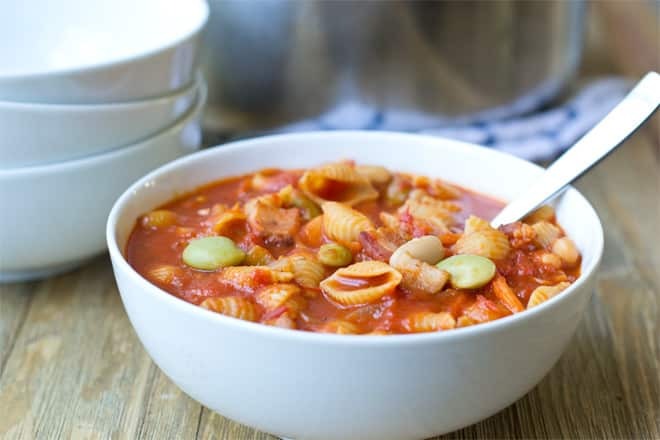 In a soup pot or Dutch oven combine the soaked beans, onion, three-quarters of the red pepper, the smoked paprika, thyme, carrots, saffron and chicken broth. Bring to a boil over high heat. 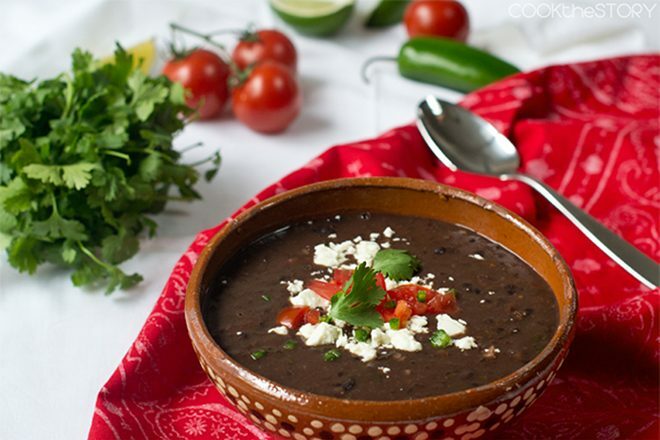 Reduce heat to low, partially cover and simmer until the beans are beginning to tenderize, about 30-45 minutes. Add the diced tomatoes with their juices, 1 and ½ teaspoons of kosher salt and ½ teaspoon of coarse black pepper. Return pot to a simmer and cook until beans have reached the desired level of tenderness. For me, that’s another 45 more minutes. Add the chorizo and cook until it’s warmed through, about 5 minutes. Taste and add more salt and pepper if needed. Meanwhile, in a medium sized bowl combine the Manchego with the remaining bell pepper, parley, garlic and olive oil. Toast the bread. When the soup is ready, preheat your broiler. Ladle the soup into oven-safe bowls. 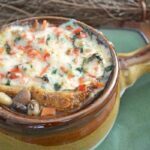 Top each bowl of soup with a toast and 2-3 tablespoons of the cheese mixture. Transfer the bowls to a large baking sheet (this makes it easier to carry them and easier to get them out from under the broiler ). Put the baking sheet full of bowls under the broiler and broil until the cheese is melted and bubbling and just beginning to brown. Soaking dry beans: The easiest way is to combine them with 3-4 times their volume of water and leave them out over night. I never remember to do that. People claim that you can instead cover them with all that water, bring them to a boil, remove them from the heat, cover and leave them for an hour. When I do this the cooking times in recipes don’t match up to my reality. I instead bring the beans to a boil but then let them sit for at least 2 hours and even 3 hours if there’s time. However you cook your beans, don’t be discouraged if the specified cooking times still don’t work out for you. Cooking beans depends on their soaking but also on how old the beans are and sometimes on the ingredients you’ve combined with them (acids and salt for instance can slow the cooking time in some situations). Just start early enough in the day so that you can let them simmer until they’re how you like them. This post is sponsored by Bob’s Red Mill. 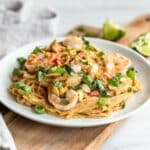 I was compensated for creating the recipe and writing the post, but all thoughts and opinions are my own. Oh this looks fabulous, Christine!!! I’ll be making this recipe soon! Delicious, thanks for the share!!! Mmm, this soup is finger licking! And the broiled bread on top is to die for!